Under the Professional Standards Framework (PSF), The “Ks” are your Core Knowledge. This is the knowledge you need to carry about your teaching activities. There are six components of Core Knowledge (K1 – K6) and these are to be referenced throughout your reflective narrative through annotations. 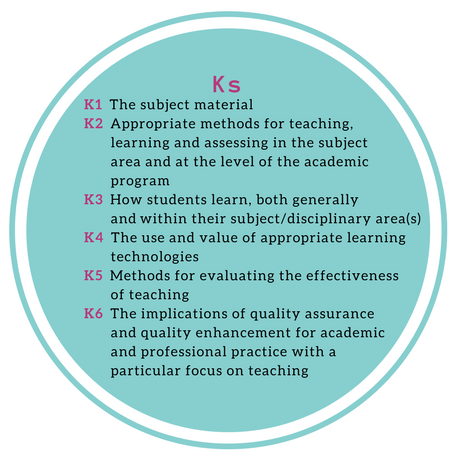 Associate Fellows of the HEA (AFHEA) need to ensure they evidence K1 and K2, while Fellows (FHEA), Senior Fellows (SFHEA) and Principal Fellows (PFHEA) need to reference all six Ks. You will find it easiest to demonstrate your understanding of Core Knowledge as you talk about your experience of different Areas of Activity. For example, when you are reflecting on designing and planning a learning activity (A1), you would probably want to refer to the importance and relevance of your subject knowledge (K1) and your use of discipline-appropriate teaching and learning methods (K2). Similarly, when you are talking about your teaching activities (A2), you would probably be referring also to your understanding of how students learn differently and specifically in different contexts (K3) and the use of appropriate learning technologies (K4). Let’s go through all the kinds of Core Knowledge. This relates to how well you know the material you are teaching as knowledge of the subject/discipline is important to the design and planning of learning activities and programmes of study, as well as the associated teaching, assessment and feedback strategies. For those in learning support areas, think about your “subject” as the nature of the “service” you provide, e.g. study skills support, information management, learning technologies etc. Since 2014, I have taught a section of the course xxxx. I have much experience with this course and material having taken it as a student in 2006, served as a laboratory demonstrator for 2007-2011, and undertaken a PhD (2008-2011) and three postdocs (2012-present) working in a related field (K1). an awareness of scholarship, and possibly research (if appropriate to your role) relating to the particular subject, which in turn informs the curriculum/program of study. How can you demonstrate this? contributing to professional body accreditation. I found out in early lessons that sharing and responding to ideas and discussion can only happen when students have a certain minimum level of knowledge, which could not be expected in a beginners’ class. Therefore, to promote active learning, I had to provide scaffolding appropriate for each student (K2). What is your rationale, underpinned by scholarship, for your approach to teaching in your discipline, and how do you show evidence of its effectiveness? For example, you might explain your rationale for the use of group work in tutorials in your subject, or why demonstrations are an important element of teaching your subject. K2 is often linked to both K1 and K3, specifically concerned with the strategies and approaches used to teach or support the learning of the subject. You should also refer to the challenges encountered by different groups or types of learners and indicate how you are able to adapt accordingly. Examples of K2 might include discussion of your experiences of appropriate use of group work; lab-based teaching; workshops; or problem-based learning. K3 is related to your knowledge of how students learn, in general and within the context of their subject/discipline. You will need to demonstrate your understanding of the characteristics of different learners (such as mature students, recent school leavers or workplace learners) and how you meet their needs through the teaching and supporting learning approaches and the learning environment. In this situation, I will often prompt the student to think about things that prompt ion movement before giving them the answer. This is to give them an opportunity to develop their own ideas behind certain concepts (K3). You will also need to show how you adapt and change your practices and approaches in response to the specific characteristics of your subject (related to K1). Reference could be made to different theories of, or approaches to, learning and how you use these to develop subject-specific strategies for teaching and supporting learning (also related to K2). You need to describe, and reflect on, the characteristics and diversity of the learner cohort with whom you are involved, ideally with reference to scholarship and inclusive teaching practices so that you demonstrate a scholarly understanding of the particular theoretical models which underpin your practice. your sensitivity to the varied learning styles of students. K4 explains your knowledge and use of learning technologies. These are many and varied, and typically you are expected to go beyond describing a basic use of PowerPoint and a virtual learning environment. In many instances the use of learning technologies will be highly subject or context specific, so your rationale for using specific learning technologies needs to be clearly articulated. … students are strongly encouraged to put their general and assignment questions on Wattle for discussion among peers and myself. I encourage this, as it promotes peer interaction, and also gives a chance for those who are reticent to speak up in class to have an input (K4). how you have evaluated the impact on learning that occurs because you are using technologies. how you support online learning and information management. You might also like to read the digital lens on the PSF. An essential part of higher education is ensuring the effectiveness of teaching practices., so K5 is concerned with the ways you gather information about the success of your teaching, assessment and feedback in enabling students to meet the intended outcomes. Your evidence for K5 should focus on the ways you use different approaches (formal and/or informal) to gather information and data about the impact of teaching, and how this is used to enhance and develop teaching and learning support practice. using information from external evaluation or review to critically analyse your practice and make desired changes. formalising feedback mechanisms and analysis of results. K6 is about demonstrating awareness of the implications of providing high quality teaching. While this is possibly one of the hardest kinds of Core Knowledge to articulate, you should try to demonstrate that as a teacher or supporter of learning you do not ‘exist in a bubble’ and that you are responsible to external imperatives (for example, institutional quality assurance, professional bodies) and that you can demonstrate that you work towards improving practice in this context. Quality assurance and quality enhancement are deeply embedded in higher education through procedures such as program (degree) and course validation, monitoring, review, benchmarking and examiner boards. These processes shape academic practice and are implicit in what you do as a teacher or in your support of learning. Critical to K6 is your awareness of formal quality assurance and quality enhancement processes and requirements, such as the need to work within institutional frameworks and professional and statutory body requirements. Foundations module F1 would be a good starting point if you don’t know much about the higher education infrastructure of Australia or ANU. Students from my group have gone on to jobs in industry, academia, government and education. I am proud that they have learned skills to follow these careers and I feel that this is measure of the quality of their education (K6). How can you demonstrate that you have this knowledge? how you use national evidence frameworks (such as the Australian Quality Indicators of Learning and Teaching – QILT – to understand how ANU teaching in your discipline is rated nationally. You may also think about evidencing your personal interest in, understanding of, and commitment to quality assurance and enhancement procedures, and how these are established and embedded within your practice. This would typically include evidence of a knowledge and understanding of the quality assurance frameworks at a national level and how these are manifested (at the appropriate level and context) in your work. A1: Design and plan learning activities and/or programmes of study. A2: Teach and/or support learning. A3: Assess and give feedback to learners. V1: Respect individual learners and diverse learning communities. V2: Promote participation in higher education and equality of opportunity for learners. V4: Acknowledge the wider context in which higher education operates recognising the implications for professional practice. Some engagement with formal processes and commentary on how these have shaped practice will demonstrate that you are not merely adopting a tick box approach but show your understanding of how assurance and enhancement is applied, its impact and why it is important to the student experience and wider context. obtaining feedback from external examining, moderation into practice.